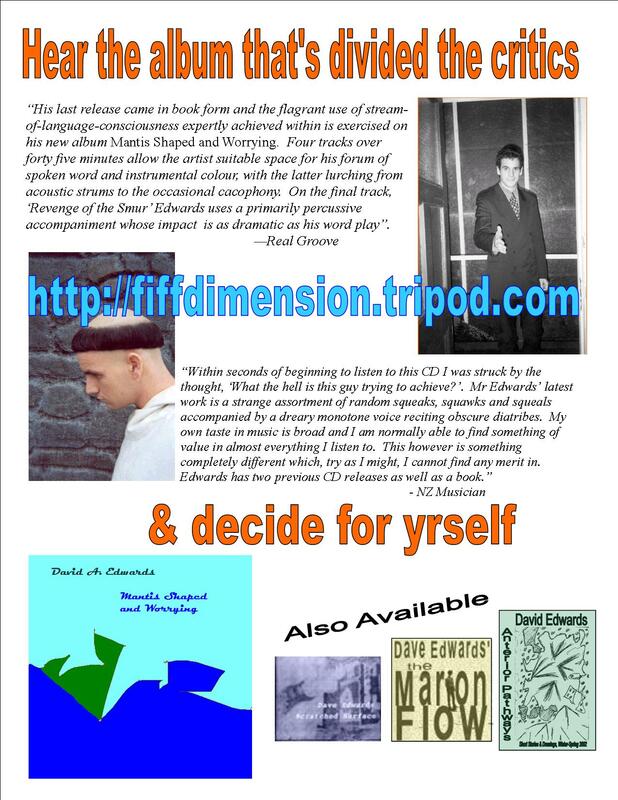 The difficult third album – recorded during a time of intense introspection in 2002. I locked myself in my room in Wellington for all of November with an analogue 4-track tape recorder, electric bass, guitars and harmonica and wrestled with the void.The results rapidly put an end to my promising New Zealand music career! This entry was posted in 2002, Free mp3s, Music, New Zealand and tagged 2000s music, 2002, acoustic guitar, avant-garde, Dave Edwards, early 2000s music, electric, electric guitar, experimental, fiffdimension, Free mp3s, harmonica, kiwi, music, new zealand, New Zealand music, NZ, percussion, Simon O'Rorke, spoken word, Wellington.